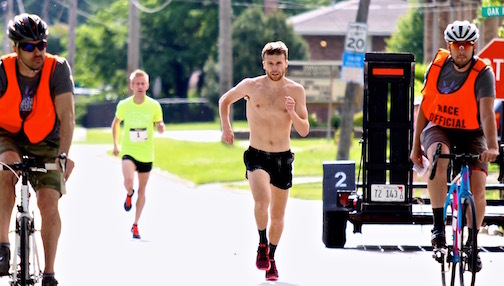 On Saturday, June 3, 2017 the 5th annual Super Sunny 5k offers a flat & fast residential course on the streets of Burbank, IL. The Super Sunny 5k is chip-timed. NEW for 2017 the course will be USATF certified. Our course is accessible to all athletes. Wave start will be employed if needed. Free registration for guides is available for any athlete who requests it. Our TOP DOG DIVISION was a huge hit in 2016, so it is coming back! The dog division is also chip-timed, has a wave start, and has its own award equal to those in the main 5k. All dog and runner pairs must start with the dog division wave at 8:45am. The Team Competition is on again in 2017! To score teams must have at least 3 people, and not more than 6. Top 3 times are scored. By popular demand the Super Sunny 2017 will include a FREE Kid's Dash! Held right after the 5k participants have finished. Particpants and volunteers will recieve one of our super soft event shirts, everyone continues to rave about the 2016 version! All proceeds from this race go to support services for Chicago area adults with intellectual and development disabilities. The race organizers, Garden Center Services, are committed to providing person-centered residential, vocational, and therapeutic services with the goal of fostering independence, community integration, and choice. To follow along with event and fundraising developments please follow us on Facebook. Your fundraising effort directly impacts the everyday life of Garden Center Services program participants and services consumers! 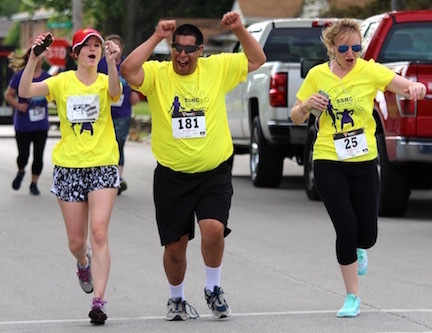 The Super Sunny 5k brings together friends, families, and disability advocates to raise funds that help maintain the daily supports provided to adults with intellectual & developmental disabilities by Garden Center Services. Illinois is currently facing a $70 million shortfall in funding for services for people with developmental disabilities, this is in addition to our annual funding gap of $300k for day services alone. GCS is committed to providing services that are progressive while they grow independance while fostering choice, self-determination, and self-advocacy. Donations not only help us to very literally keep the lights on at our programs and homes, but they also mean access to healthy and homecooked food, job training and employment opporuntities, and the simple permission for all those we serve to lead a life that offers them the support to follow dreams and contact the respect and dignity that all people deserve. The race starts and finishes at Newcastle Park (8050 S Newcastle Ave). An aid station will be located at approximately 2.25 miles. The start/finish line is located at the intersection of Newcastle Ave and the parking lot. The parking lot at Newcastle Park will be CLOSED on race day for event staging and para-athletes only (as requested). Free street parking is available along Newcastle Ave, as well as the surrounding area. Awards will be given to the top 3 male and female finishers in each of the following catergories. Top 3 overall Male and Female runners wil receive awards and will be excluded from the age group categories. 14 & under, 15-19, 20-24, 25-29, 30-34, 35-39, 40-44, 45-49, 50-54, 55-59, 60-64, 65-69, 70-74, 75-79, 80 and over. 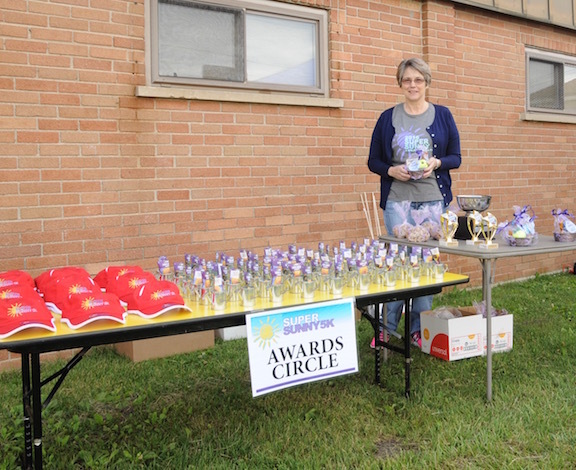 Awards will also be given to the top 3 TEAMS of 3-6 runners, and the top 5 DOG DIVISION pairs. Pre-race packet piclup will be available the week preceding the race. Please check back for details. Race day packet pickup will also be avaiable from 7am until 8:15am. Kids Dash = FREE ! All registrations include a participant shirt and dog swag.